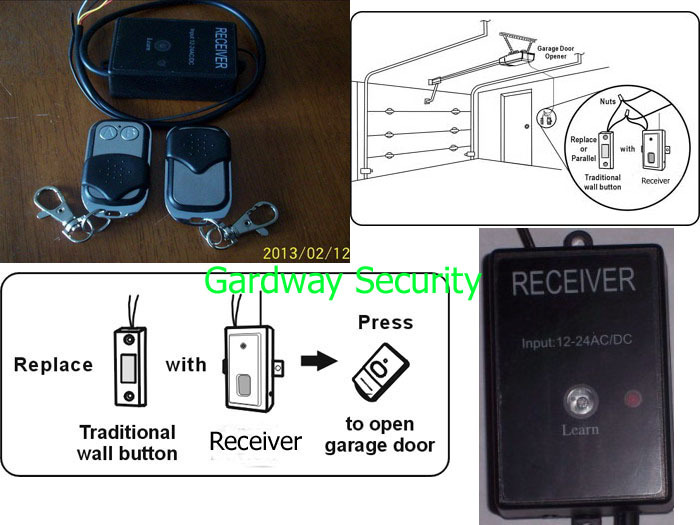 DIY Universal Wireless Remote Control Kit (Input DC/AC12V~24V ) for Garage Door or automation Slide/Swing Gate System. This 2 Remotes and add-on receiver can be used to replace any manufacturers remote as long as there is an "Emergency" switch or wired "Exit" in door switch (normal situation). It allows the existing remotes to operate in parallel too. Can be used to replace those hard to get the old remotes. 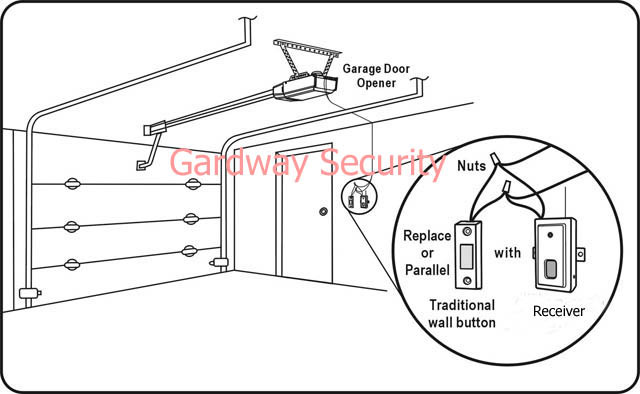 Garage Door,Automation Electric Gate sliding or Swing,Alarm,Control,Home automation. *WHITE WIRE: NO(Relay Voltage-free Normally-Open Contact) or Com(Relay Com). *Com(Relay) on Receiver wiring to Com. *Com(Relay Com) on Receiver wiring to Com. Extra $ for an additional remote keyfob. Extra $ for a Wireless Receiver Unit. 1)most of operators or openers can supply power output DC/AC12V~24V, so you don't get supply from other Power Adaptor! 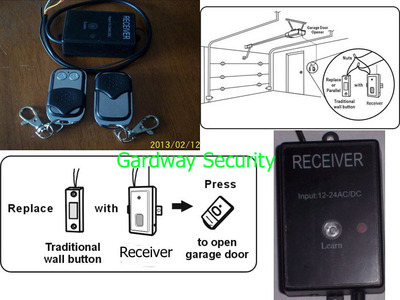 2)This kind of Remote keyfob is also compatible with BFT Automation Gate. 3)This package doesn't include any batteries due to Air Safety Post Delivery. Yes, you can do,so you can control two openers (say,one is garage opener and another is auotmation gate operator) on one remote keyfob. 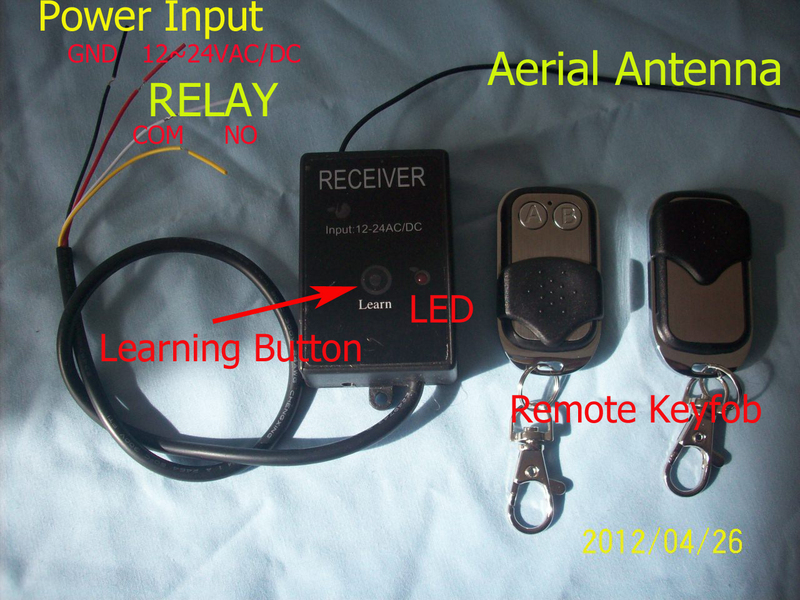 For 4-key remote keyfob, you can control 4 devices at most. Our remote keyfob is compatible with BFT Automation Gate, you can control BFT operator (by programming keyfob into BFT operator) and don't need wireless receiver unit.